Tuning a drumset is a mechanical exercise with the aim of ensuring that the tensions across a head are as equal as possible; this is the drum ‘in tune with itself’. Additionally, there are tuning relationships between the heads on the same drum and also with the other elements of your kit. Tuning is a purely mechanical exercise and therefore there are many varied ways of delivering an appropriate tone from a drum. The choice of tones, timbres and relative tensioning is a separate issue and discussed here. The method that I advocate here is one that works for me, however I recommend you experiment and take other advice. Once you understand the principles the methods become apparent. 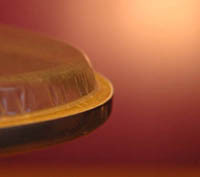 Drum heads are generally made from Mylar which is a plastic. Over a period of use, particularly with batter or top heads, that plastic will heat and stretch or be forced out of shape by force as it absorbs the impact of a players’ strokes. When a drum head gets to the point that you either cannot tune to / maintain a single pure tone, or you physically disfigure the head, it is time to replace the heads. Resonant bottom heads don’t lose their tone as quickly, but they are still under tension and should be checked and replaced regularly, A reasonable rule of thumb might be to change resonant heads with every third or fourth change of batter heads. To get the best out of your drums therefore you should use fresh heads. To really understand the tuning process and be able to hear the nuances of the skin telling you what it needs, you should work with single ply heads initially, I’m not suggesting that you use them for your playing, although many professionals do, but they are the best medium with which to illustrate the tuning process and to let you hear the voices of the drum as we move through that process. The same fundamental tuning principles are applied to all drums in a drum kit; whether kick, snare or toms. Over & above that, bass drums & snare drums involve other considerations which we will address after looking at basic batter & resonant head tuning on toms. Fine tuning – the nitty gritty!